This office building for the Government Buildings Agency was erected as an experiment for the Ministry of Housing, Spatial Planning and Environment. A so-called dynamic office building, it comprises non-territorial workplaces so that storage space is reduced per user and interaction and communication between users encouraged. 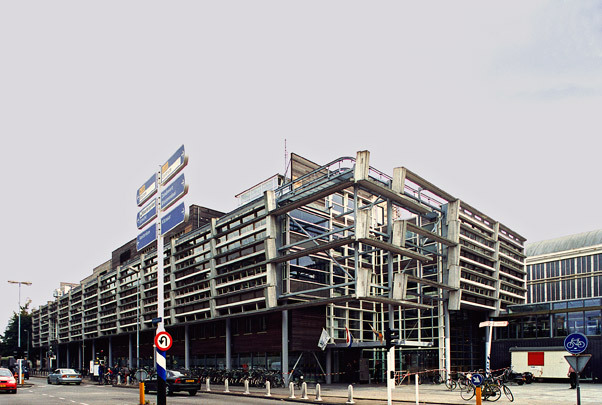 It is also an example of sustainable building as well as being most favourably situated for public transport to the rear of Haarlem railway station. The building has a facade of protective concrete screens with shards of green glass worked into them. Five staggered light courts of seven by seven metres atop voids deliver daylight deep into the building.